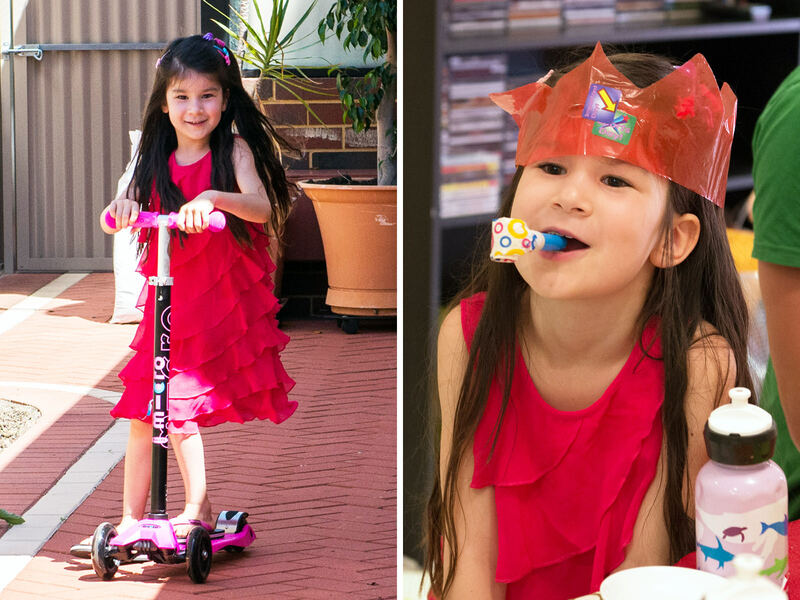 Jac and I hosted my family’s Christmas lunch this year. We got up bright and early to get ready for the day. 11-year-old Pixel watched suspiciously as I set the table (she’s not a fan of parties) while 1-year-old Truffle inspected everything with great fascination. Both cats fled and hid when everyone began to arrive. 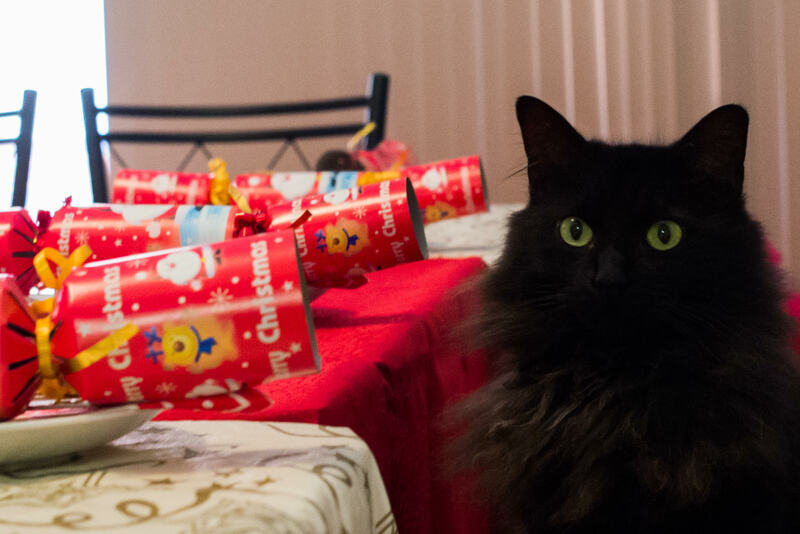 Pixel isn’t pleased… all signs point to a party. It was BYO booze – this year, it was all about Matso’s Broome Brewery mango beer and ginger beer – but for anyone not into beer, I made a non-alcoholic punch. I used the same recipe as last year, combining Rochester Ginger, apple-mango juice, soda water, strawberries and torn fresh mint leaves. 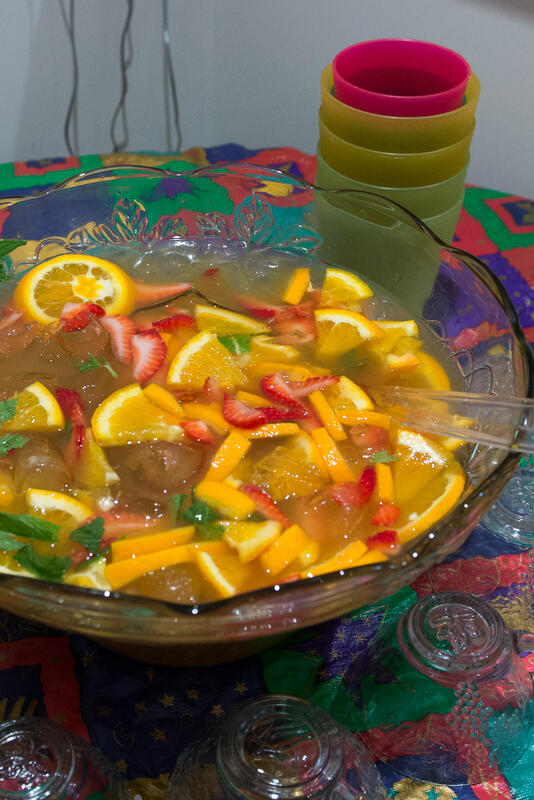 We borrowed an old-fashioned glass punch bowl, complete with ladle and cups, supplemented with IKEA plastic tumblers, and kept the punch topped up with the juice, soda water and ice. With Juji busy tending to the Christmas ham and Angela’s vegies going into the oven, Jac decided it was too crowded to work in the kitchen; she assembled our starter of prawn cocktails in the laundry on a tray on the washing machine. 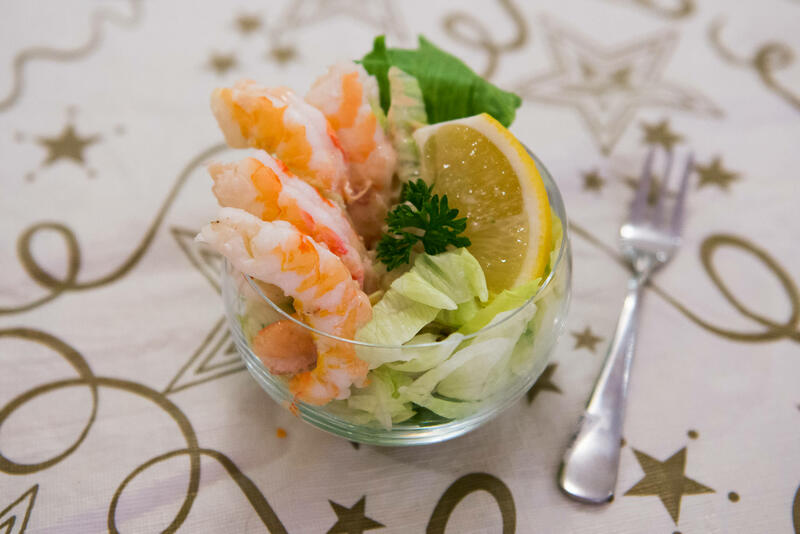 Each prawn cocktail consisted of cold cooked peeled prawns, iceberg lettuce, a lemon wedge and sauce Mary Rose. 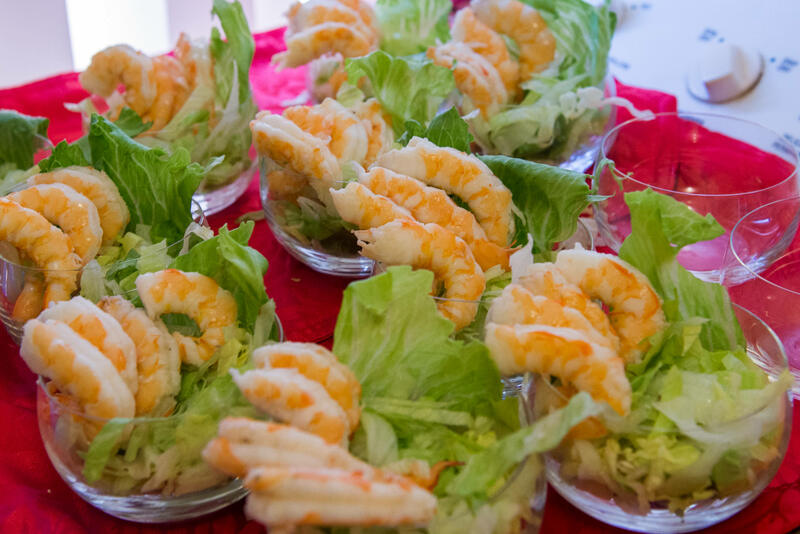 The recipe was another internet special: Prawns with Sauce Mary Rose. The original recipe serves 4; to serve 13 people, Jac tripled the recipe in every respect apart from the mayonnaise – instead of 3 x 350 ml, she used around 800 ml mayonnaise. That was the point at which her official taste tester i.e. me, declared the sauce delicious! Prawn cocktail. A jug of extra Mary Rose sauce did the rounds as some of us preferred heavy sauce. Jac and I bought make-your-own Christmas cracker kits which include the empty crackers, party hats and (bad) jokes, and one of my Christmas tasks this year was putting together the crackers. 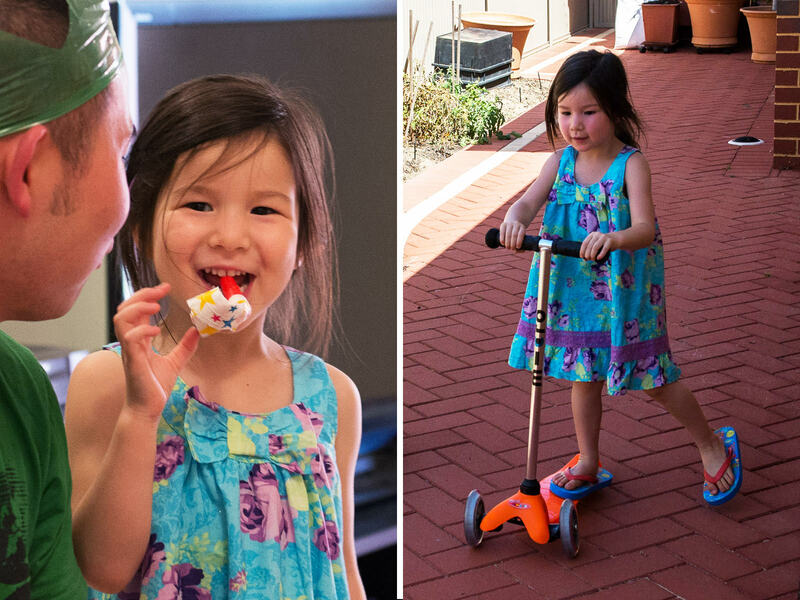 I added other goodies – chocolate, party blowers, stickers and LEGO minifigures. I wanted to include something fun that you wouldn’t normally find in a Christmas cracker (enough of magnifying glasses you can’t really see through, and figurines that don’t quite stand up! ), and our family’s always loved LEGO. I got the LEGO from Target the week before. I collect these collectible minifigure series myself and I knew they’d be a hit. Both the kids and the adults were intrigued by the characters that popped out of the crackers, which included a thespian, German guy in lederhosen, conquistador, evil robot, alien queen, fairy, pirate captain, cheerleader and skier. Each minifigure came with accessories (thespian had a skull; German guy, a pretzel; fairy, a wand; cheerleader, pom poms; and so on). 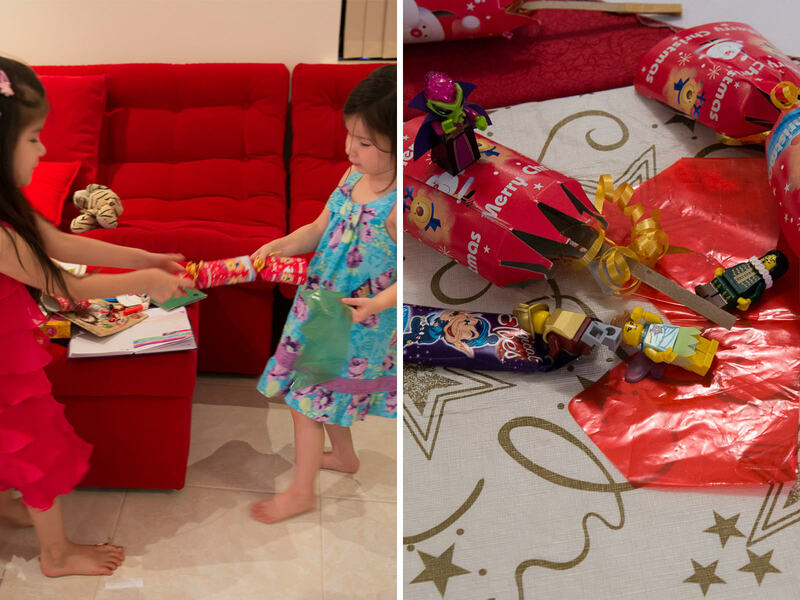 I didn’t put the accessories into the crackers to avoid them going missing as crackers popped open – they’re such tiny parts and could easily get lost under the couch; I gave them out individually as everyone claimed their minifigures. LEGO fans, these were Series 8 Collectible Minifigures. With the hot weather I made the crackers at the last possible moment but that didn’t stop the chocolate from turning to mush – we put the chocolate in the fridge (though the kids were quite happy to eat chocolate goo – the messier the better, I think). Now that we all had our party hats on, it was time for lunch. We had all been looking forward to Juji’s Christmas ham, painstakingly studded with cloves, baked and glazed with a sticky mixture of honey, orange juice, mustard and maple syrup. Juji glazed and carved the Christmas ham while we watched and drooled. To go with the ham, Juji made ham jam. She didn’t follow a recipe – just made it up herself using pitted cherries, apple, cinnamon, star anise, sugar and verjuice. It was a fantastic accompaniment to the ham, and Jac and I were chuffed to score what was left in the jar at the end of lunch. The ham jam was an inspired accompaniment! Juji also roasted potatoes in duck fat, crisp on the outside and fluffy on the inside. She served up the extra-crunchy bits too, which were much coveted. 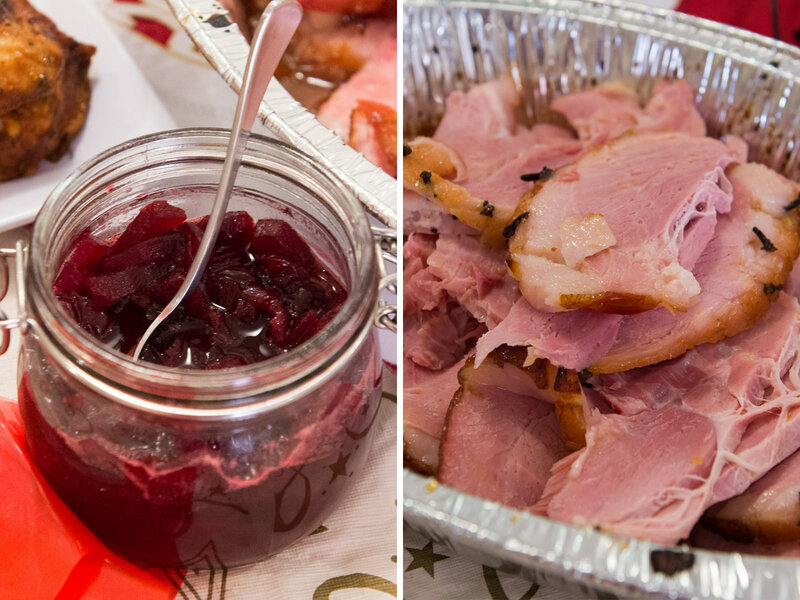 The ham was magnificent but we could never contemplate a Christmas feast with just one meat! Mum cooked a family favourite, peri-peri chicken. 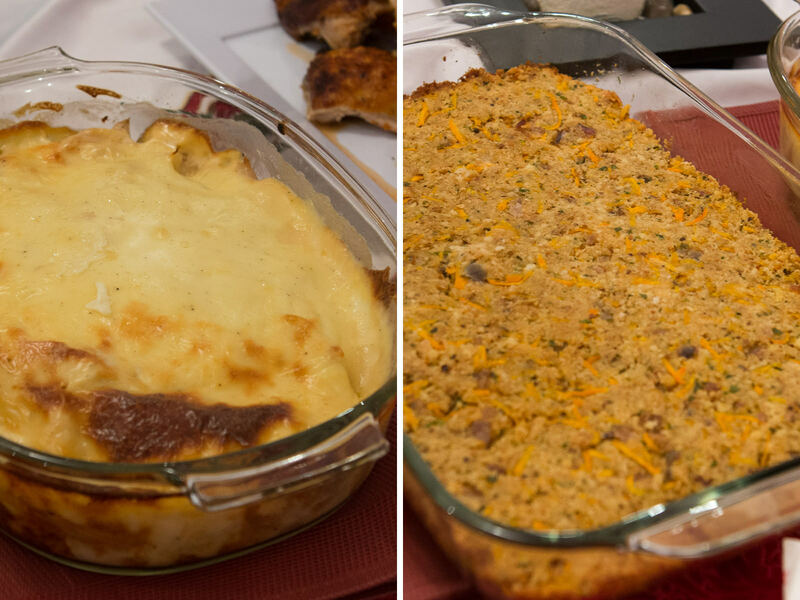 Angela made cauliflower cheese and baked stuffing, another favourite family dish. This year, my sister CW’s friend K came along for Christmas lunch too. 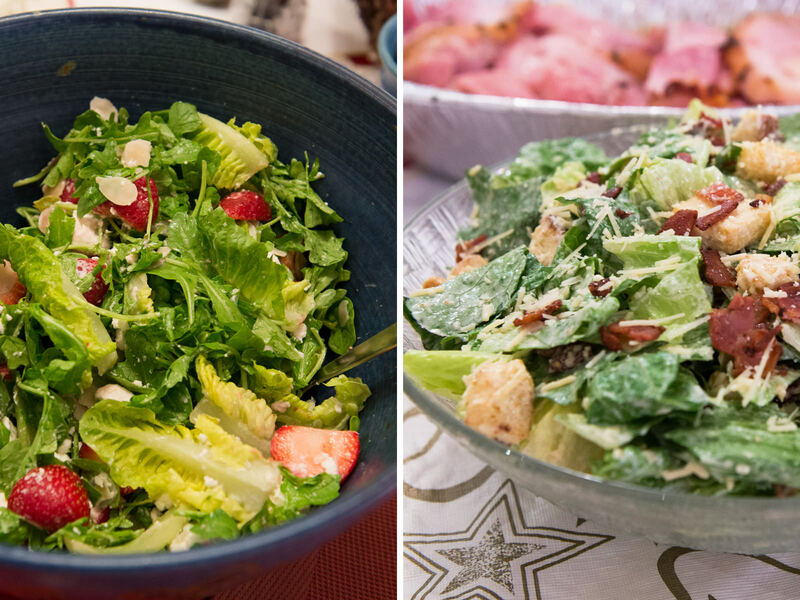 She brought along a lovely salad made with lettuce, rocket, goat cheese, flaked almonds and strawberries with an oil and balsamic vinegar dressing on the side. Jac made Caesar salad. So that was our Christmas lunch feast. And after all that food, let’s face it – we needed a break. Between main course and dessert, we exchanged gifts, and my niece Zoe surprised us with her talent for Jenga in a match against her Uncle Mike. 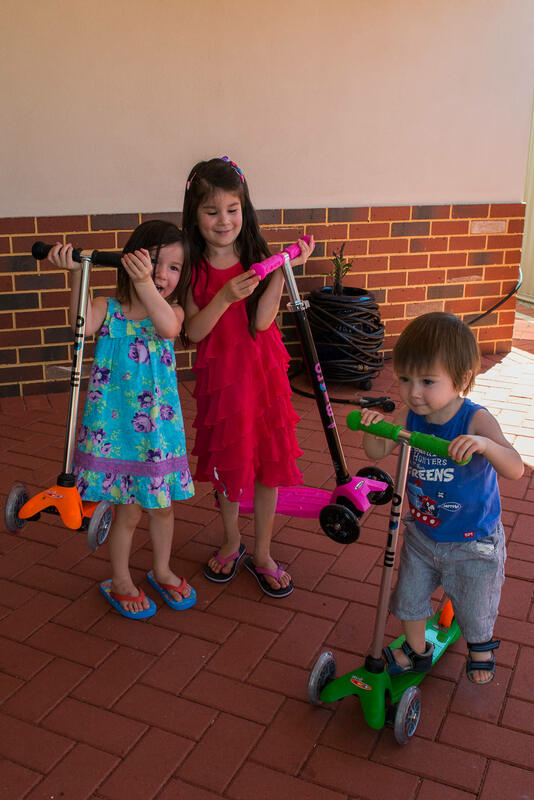 We’d all chipped in to get the kids new scooters for Christmas. My brother had stashed them in our garage so we could surprise the kids with them. 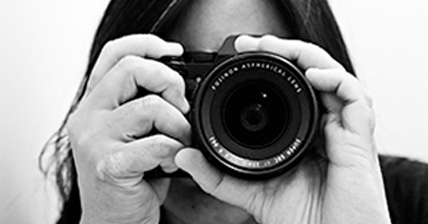 Out of sight, out of mind – we almost forgot about them completely! Once revealed, the kids were thrilled and wanted to try them out immediately in the backyard, despite the temperature hovering around 38C by that time. It was a short but exhilarating session. This is as close as I got to a group shot – new scooters were simply too exciting! For safety-conscious readers, yes, the kids do wear helmets normally. There were three parts to dessert. 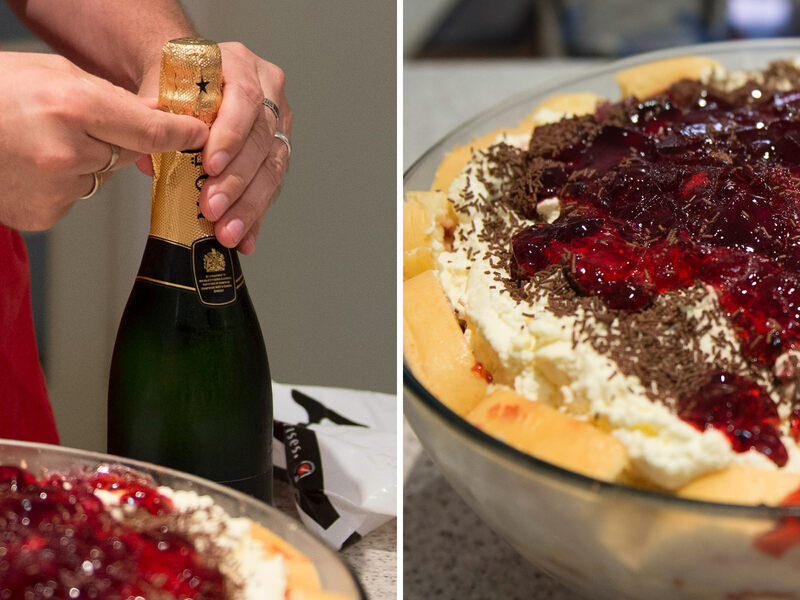 CW had made her famous ginormous trifle, which we adults enjoyed with champagne and strawberries. She also surprised us with a big bowl of milk and dark chocolate-covered cherries. 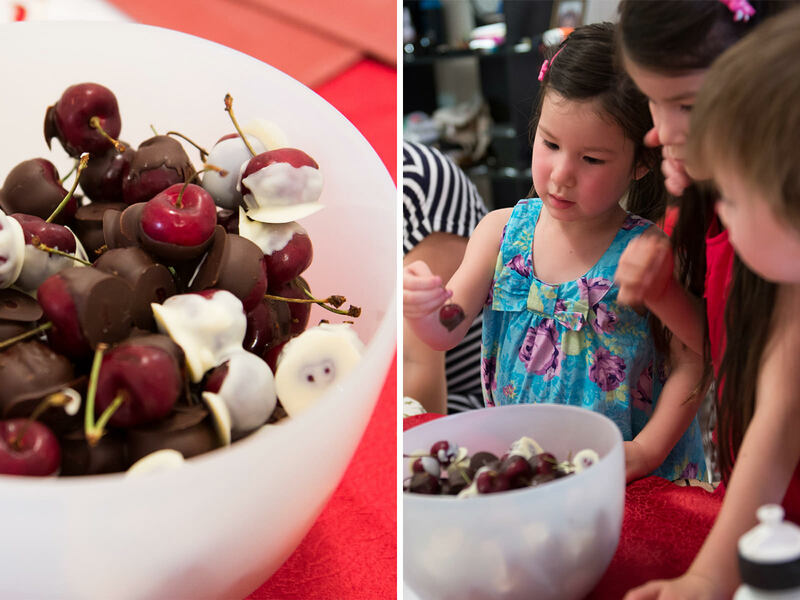 For the kids especially, choosing a cherry to eat next – each time, a new decision of white or dark – was part of the pleasure. We’ve been sweltering through a heatwave in Perth – Christmas day got to 39.6C. We’ve had five days in a row so far with top temperatures in the high 30s or low 40s, with more on the way. 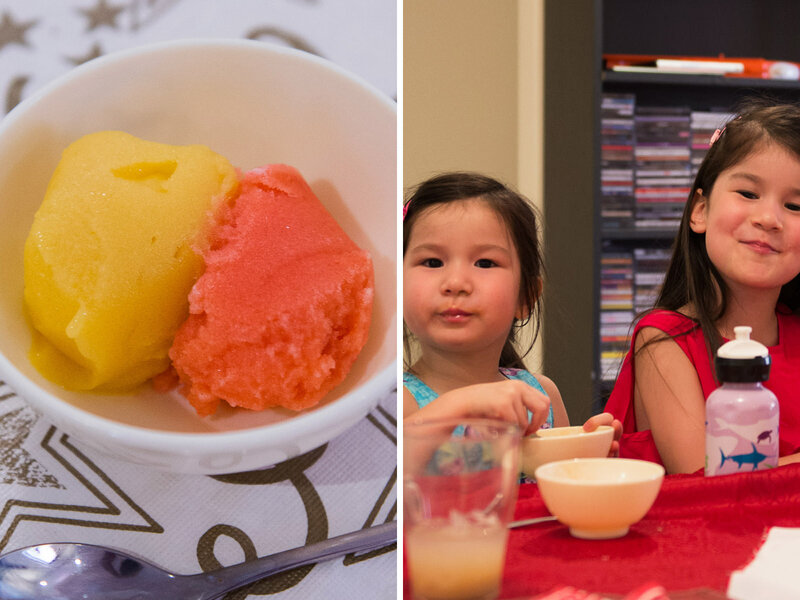 The trifle and cherries were wonderfully cold out of the fridge but Angela’s homemade mango sorbet and strawberry-lemon sorbet from the freezer really helped cool us down. The best part about Christmas? The kids’ joy and excitement. Ruby’s scooter was pink, of course. It’s still her favourite colour. Zoe and Ruby both loved the party blowers from their Christmas crackers – between them, it sounded like a flock of geese had come to lunch. 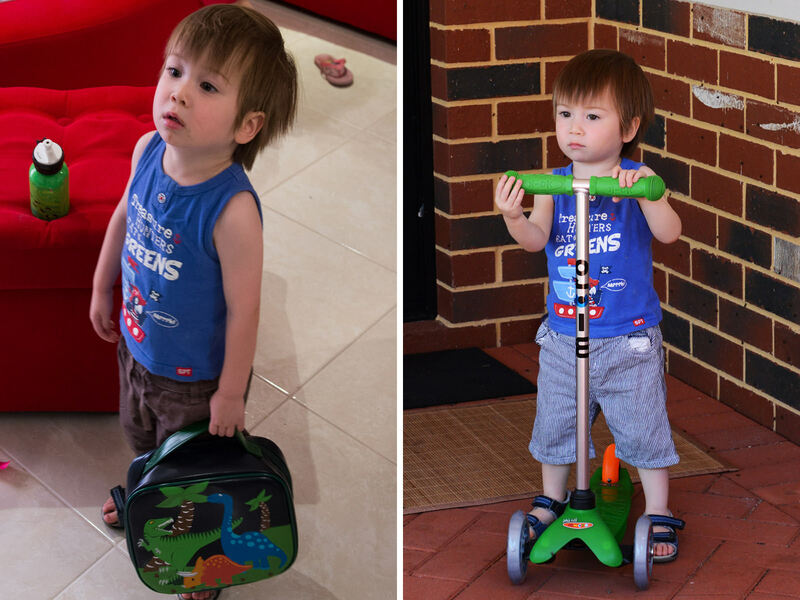 Caleb turned up to lunch clutching his dinosaur manbag. He wasn’t as confident on his scooter as the girls (he veered off the paving and had to be rescued from the garden bed a few times) but he was very determined and I know he’ll get better with practice. 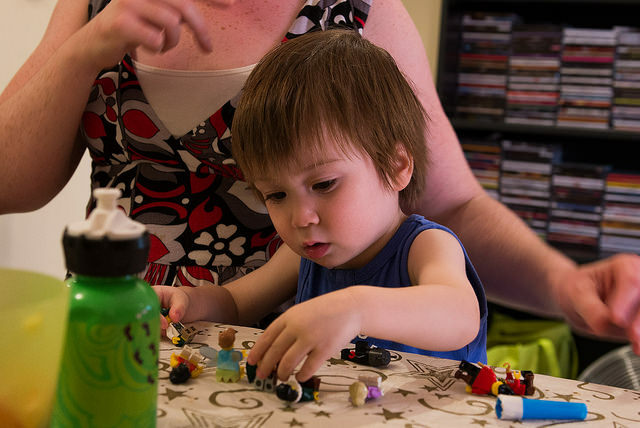 We got together for his 2nd birthday party yesterday – happy birthday, Caleb! The feasting has continued beyond Christmas. This was breakfast on Boxing Day, simple but tasty (and I plan to have another before all the ham jam is consumed): a toasted sandwich with Christmas ham, ham jam and Brie. 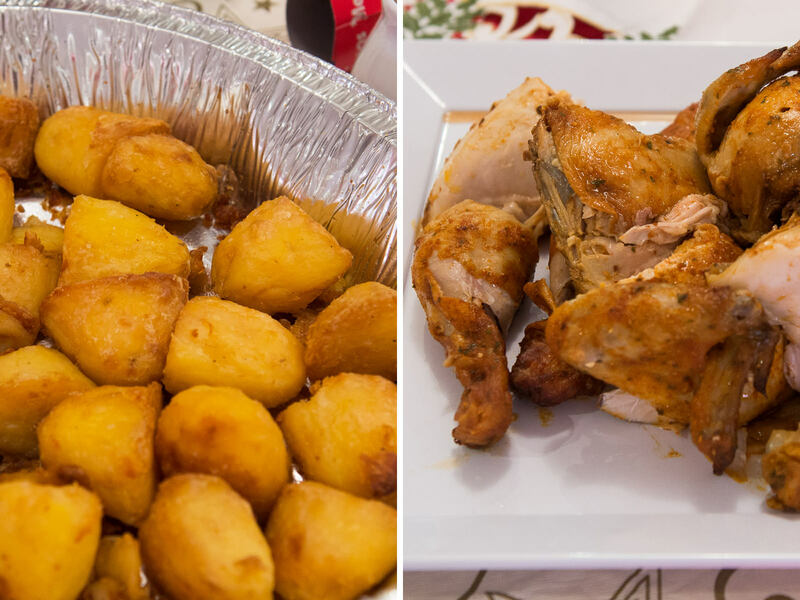 I’d love to hear about your Christmas day food and Christmas leftovers creations. 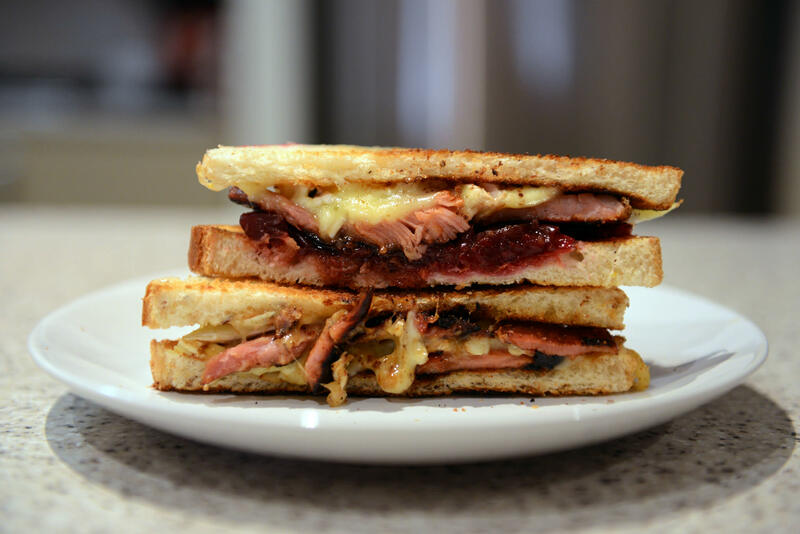 Toasted Christmas ham, ham jam and Brie sandwich. I hope you had a good festive season, have enjoyed a bit of a break and got to catch up with friends and family. I’m back to work after new year’s day. It’s looking like a big year ahead. Happy new year!